Correctly identifying stones used in vintage costume jewelry can help both buyers and sellers research, value, and catalog their collections. Dealers can also market their jewelry more effectively using terms recognized by collectors. In turn, buyers can more readily find these items when searching online if familiar terminology is used, which benefits both sellers and the collectors seeking vintage pieces. Sometimes that means including a collector's nickname in a keyword rich title. Vintage costume jewelry containing unusual stones can be very valuable, so it is wise to identify them correctly. Note: Some of the nicknames collectors have given stones over time might be more commonly used, but sellers of replacement stones may describe their wares based on what's listed on vintage packaging rather than using these more casual monikers. In the descriptions below, both names are given where appropriate or mentioned in the description of those particular stones. Aurora Borealis is an iridescent rhinestone finish developed by Swarovski (a maker of fine rhinestones and Austrian crystals still in business) in 1955. These rhinestones were widely used in costume jewelry manufacture in the late 1950s and early 1960s in numerous colors. They are sometimes misattributed to earlier beads made with an iridescent finish or referred to as carnival glass in error. Aurora borealis stones are still being used in costume jewelry manufacture although those incorporated in mass-produced imports are not usually of the high quality exhibited in the Swarovski originals. However, the name is used now to describe any rhinestone with an iridescent finish. A type of cabochon stone with a very high dome, often resembling the end of an actual bullet (as in ammunition). Can also be oval-shaped in costume jewelry but with a high dome in comparison to other oval cabochons. These have a flat bottom which allows them to be glued into a jewelry setting, but they are often prong set in costume jewelry as shown here. Originated as a natural gemstone cut later copied by stone manufacturers and fashioned of glass or plastic. Costume jewelry manufacturers such as DeLizza & Elster (makers of “Juliana”) and Hattie Carnegie used brightly-colored cabochons of this type in some of their most popular designs. Cabochons have a domed-shaped top and a flat or bluntly faceted bottom surface. Variations may be slightly flattened, but they are always smooth on top. They come in varied shape such as oval, round, and pear. It may be made of precious or semi-precious gemstones, or of glass, and used in both costume jewelry and fine jewelry made of gold. Cabochons are usually highly polished but may be frosted in glass examples. See above for high dome variation. While these stones are usually referred to as "opal" with the associated color such as green opal or blue opal (as noted on original packaging of vintage stones) by stone resellers, a“cat’s eye” is a widely used collectors nickname. These clear cabochon stones are made by backing a piece of domed glass with the foil of varying colors. Usually round or oval, but occasionally found in marquis or other shapes, each stone in the same color family is slightly different due to variations in the foil. These are often set with rhinestones in coordinating colors in costume jewelry designs of the late 1950s and through the 1960s. Designs employing this specialty stone are very popular with collectors of vintage costume jewelry. Juliana (DeLizza & Elster), Hollycraft, and Hobe, along with other manufacturers, used “cat’s eye” foiled cabochons in their mid-century jewelry designs. Note: These glass stones should not be confused with cat’s eye chrysoberyl or quartz, or simulated versions of these stones, which are usually a milky yellow or in gray color (but can be found in other variations) and feature a line down the center mimicking a feline’s pupil. A collector's nickname for stones made of glass mixed with metals to induce a bi-color effect ranging from red to blue with an overall bright blue or purplish cast. Flashes of color from within the stone are known as the "breath" from which the name is derived. These are most often cabochons (see above) in round or oval shapes which are unfoiled and transparent, but some faceted examples were used in mid-century costume jewelry. They were first used in jewelry in the early 1900s to simulate fire/jelly opals. These stones are very often set in sterling silver, and some are of Mexican origin. Dragon's breath stones are often represented as jelly opals or fire opals in error as those are natural semi-precious gemstones rather than manufactured glass, but describing them as Mexican opal glass (as found on vintage packaging) stones is less misleading. Use of the term "dragon's breath" to describe this type of stone is relatively new. It came about in the early 2000s when a marketer somewhere decided that romanticizing an imitation stone like this one had the potential for increasing sales. As often happens with nicknames applied by collectors and dealers of vintage jewelry, this one stuck. “Easter egg” is a collectors nickname for these oval cabochon stones, also known as stippled cabochons. Varied splashes of color applied to the front of the stone bring to mind decorated eggs. They are most often found in orange/green (shown here), purple/green, and purple/pink/green color combinations. While the majority of these are oval in shape, like an egg, some round variations with orange/green coloration are also referred to as Easter egg stones by vintage jewelry sellers. Pieces exhibiting these stones range from rare and valuable to common and less expensive. This type of specialty stone is not to be confused with “cat’s eye” foiled cabochons (seen above) which are also often oval in shape but manufactured quite differently. Stippled cabochons have a texture that can be felt on the surface of the stone while foiled cabochons are smooth to the touch. Marner of Providence, R.I., founded in 1946 and eventually solely owned by Julio Marcella, produced high-quality costume jewelry and jewelry components, including the patented lampwork glass heart-shaped stones incorporated in this vintage necklace marked "Hobe'." These were used in jewelry with Marner's branding marked most often Jewels by Julio or Julio Marcella, according to information provided in an article by Cheri Van Hoover on MilkyWayJewels.com. They were also used in pieces Marner made (referred to as "jobbing" in the jewelry business) for other brands such as Kramer, Hobe' and Hattie Carnegie. These glass stones are seen in a variety of colors including varying shades of pink, blue, and green, some with swirls of copper (like those shown here) having a similar look to Venetian glass beads. Marner closed its doors in 1957, so jewelry made by Marcella's company using these glass stones can most often be dated to the early to mid-1950s. They were marketed by Hobe' as "Mayorka Petals" in 1962, however, so remainder stock was likely used for those pieces. Jelly Belly is collector's nickname for this type of figural vintage costume jewelry featuring a clear plastic cabochon "belly." Pieces made with colored plastic cabochons or glass of any color are not considered to be jelly bellies. Popular pieces with collectors were made by Coro, Trifari and other manufacturers. The plastic used in many Trifari jelly belly pieces came from imperfect Lucite slabs not suitable for the manufacture of World War II-era airplane windshields (confirmed by Irving Wolfe, a former Trifari vice president). The most sought-after 1940s jelly bellies were set in sterling silver due to war rations of other types of metals. Later Jelly Belly jewelry was set in base metal rather than silver. Sterling examples from the '40s, are coveted by collectors and have been extensively reproduced, so it's wise to buy from a reputable dealer when investing in these pieces. The Margarita is a type of glass stone manufactured by Swarovski primarily used in costume jewelry from the 1960s and later. The name refers to the scalloped shape of the stone rather than a particular color, which can vary from bi-colored examples to solid colors. 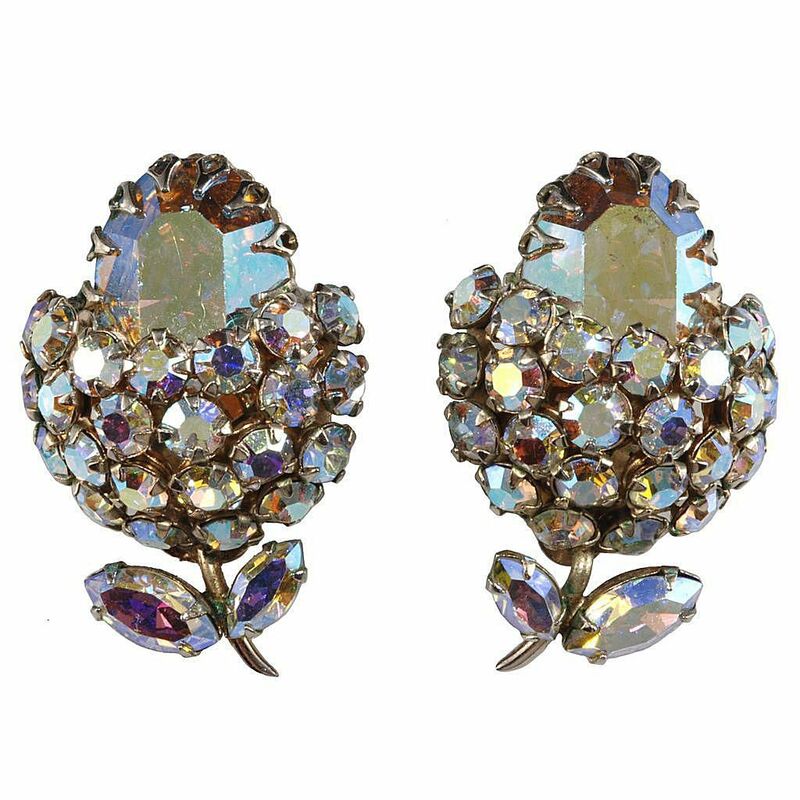 Unlike the rivoli stone (shown below), these are drilled in the middle and often set with a decorative rhinestone-tipped pin inserted through the center. They were also used in clusters on beaded necklaces. These were called "Marguerite" stones by collectors for many years, but original Swarovski packaging of vintage stones denotes the name, Margarita. This type of green cabochon stone with a cobalt blue dot in the center mimics the eye of a peacock feather. These stones were first made in Bohemia (known as the Czech Republic today) by applying glass over foil. They are usually round or oval; sometimes set in precious metals, although used more often in costume jewelry designs. Art Nouveau, Arts and Crafts, and Egyptian revival styles of jewelry featuring peacock eye glass cabochons are prized by collectors, although they are quite hard to come by today. The Rivoli is a type of multi-faceted foiled glass stone manufactured by Swarovski. It was first used in costume jewelry in the late 1950s and early 1960s. The name refers to stone with a pointed top and facets all around rather than the color, which can vary from examples exhibiting a range of hues to solid colors. They are usually prong set but can also be glued in some settings. Most often round in shape, but can be square, oval or flower shaped as well. They are usually rather large in size and prominent in designs, but sizes can vary. Rivolis are sometimes confused with inverted rhinestones in settings such as those used by Schreiner in costume jewelry from the same era, or misidentified as the scalloped margarita stone (see above). Some collectors call them "headlight" stones, especially when referring to clear examples. Saphiret is a type of glass stone with a blue-brown hue used in Victorian jewelry. Mid-century costume jewelry made during the 1950s and early '60s uses similar stones that were named Sappharine by manufacturers. Many collectors and sellers reference all these stones as saphiret, however, regardless of the age. The color in both saphiret ​and sappharine stones was derived by adding a small amount of gold to blue glass during its manufacture, and color can vary from batch to batch. Most of these stones are cabochons, but some faceted examples can be found as well. Older Victorian examples may have a satin finish. Unusual pieces containing these stones can be quite valuable. The name for this type of foiled rhinestone with pink in the center and green on the outer edge references the color rather than the shape. The collector's nickname "watermelon" is likely due to the similarity in color to the natural gemstone known as watermelon tourmaline. The manufacturer's name for the color of this stone is Vitrail II Medium.This color is sometimes called heliotrope erroneously since heliotrope is a bi-color blue stone rather than pink and green. Most often seen in the round and oval shapes, but the color can also be found in the margarita or rivoli shaped stones as well. These stones were incorporated into many pieces dating to the 1950s bearing the Schiaparelli mark as well as many signed Judy Lee (a home party company). Many unmarked pieces of Juliana jewelry made by DeLizza & Elster in the 1960s are embellished with these stones.